The state budget for 2018 shows the government plans to spend HUF 237 billion on sports, reports 24.hu. That’s up from HUF 66.8 billion in 2010, a 254 percent increase since the Orbán government took office. Similar increases in spending have not occurred in other more critical areas. For instance, spending on education in 2017 has increased only five percent since 2010. Spending on health-care increased only 25 percent in the same period. While subsidies for families amounted to some HUF 570 billion in 2010, the 2018 budget will provide HUF 555.2 billion. Spending on law enforcement has also seen a sizable increase, although it’s nowhere near that of sports, up from HUF 562.8 billion to HUF 901 billion. Spending on public transport and telecommunication services has just about doubled since 2010. But social welfare receives about three-quarters of what it did in 2010, and unemployment welfare receives about one-fifth. According to 24.hu, sports spending largely revolves around competitive sports and much of the expenditures go toward constructing facilities. 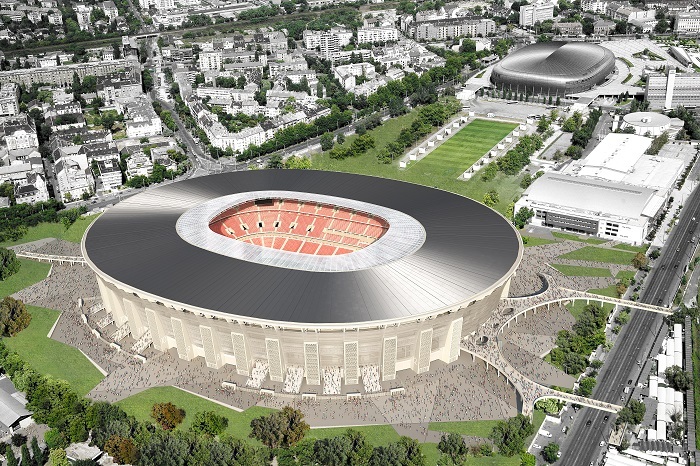 The reconstruction of Budapest’s Puskás Stadium (modeled above) alone will cost HUF 190 billion. Next year, the government will spend HUF 65.8 billion on the stadium — which happens to be the total spent on sports in 2010. 24.hu reports that it’s difficult to gauge precisely on what these allocations for sports will actually be spent. These line items may be deceptive in their line-item listing in the budget. For example, the HUF 65.8 billion for the Puskás Stadium runs under the title of National Olympic Center. In addition to the budgetary earmarks for sports, last year the state allowed corporations to defer some HUF 99 billion in corporate income taxes for Hungary’s five main competitive sports. This year, volleyball will be added to the state’s corporate income tax donation scheme, meaning the amount of corporate contributions to sports will likely grow. Since the corporate income tax donation scheme was introduced, more than HUF 415 billion has been contributed to sporting associations. 24.hu reports this number may exceed HUF 500 billion by the end of the year.